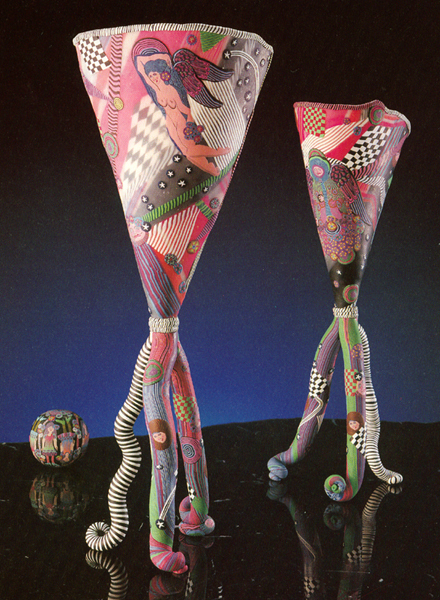 I first became intrigued by the particular characteristics of translucent polymer in 1989 when I made two goblet forms entitled “Angel’s Goblets.” I layered it very thinly with some opaque millefiore intending to let light pass through it in order to see patterns layered over other patterns. I did not continue exploring this whole idea, however, until 1995 when I had that “kick in the gut” epiphany some of us have experienced in our lives. 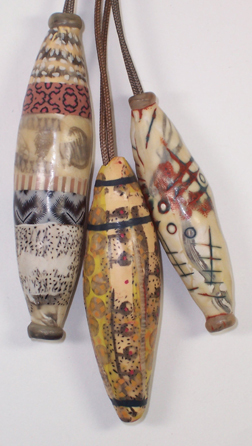 I was teaching at the International Bead Conference in Washington, DC as well as sharing a sales booth with Pier Voulkos and Ford & Forlano. We were all teaching so we could take turns manning the booth. 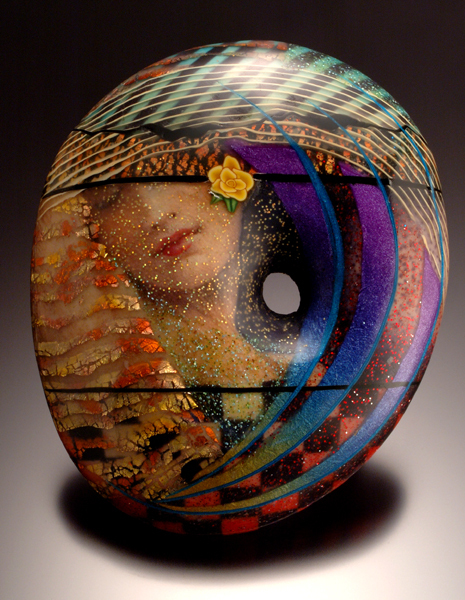 First, I bought a bead done by Lori Feiss where she had layered translucent and black polymer canework over imitation gold leaf, then polished it, so a shallow depth of surface was achieved. 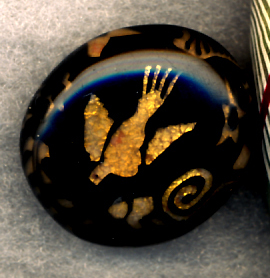 Then, in our booth I saw a few abstract beads Dave Forlano had made that had layered translucent with some patterns underneath and on the surface and it was also polished. At this point, I’d been exhausted by doing millefiore and had just about given up on polymer because I missed the richer surfaces I’d had in my days as a ceramic artist using glazes. So, after that conference I excitedly went right home and experimented making these two beads using a multiple translucent layering, multiple baking, sanding and polishing technique that launched me into a whole body of work. Shortly after that, I had another epiphany (this time in the middle of the night) about making purses and my first purse made use of this multiple layering technique. Right away I drew under translucent polymer with Prismacolor pencils and markers, soon taught a class in which one of the students drew a simple face. That inspired me into drawing my own faces under the translucent. After spending way too much time rendering each face on each piece, in 1996 I developed a color transfer technique of my own drawings to use with the translucent layering.